Vladimir Putin may aspire to be the Stalin of today, but Russians who display their affection for the Soviet dictator as on today’s anniversary of the dictator’s death do so because they understand that in boosting Stalin, they are in fact protesting against Putin and the current Russian regime, Ekho Moskvy journalist Michael Nacke says. Those who come out to show their support for Stalin in 2019, he says, are showing their support not for the actual man and his actions but for the myths that have arisen around him and they are simultaneously protesting against the absence of those qualities in the current regime (echo.msk.ru/blog/michaelnacke/2382821-echo/). But Russian citizens are not the only ones who must understand this, Nacke suggests. 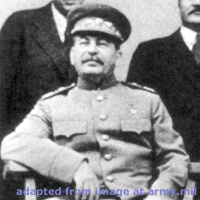 Russian leaders including Putin must as well: those who honor Stalin are not the same as those who support the current regime. Instead, they are just as much opponents of the Kremlin as its liberal opponents. Anyone in the leadership who thinks otherwise is deceiving himself.